It is distasteful looking for investment ideas driven by disasters, but it is our job. Analyzing the expected damage from Harvey and Irma – some things are obvious; some less so. Building material and related demand will rise substantially; labor shortage likely a problem. But… this should provide the supply/demand bridge to carry ethylene through the “uncertain” 12-18 months ahead caused by the start-ups in the US. 2018 global operating rates should be higher than 2016 levels – 2016 margins 10-15 cents higher than today. Ethylene is the more important investable conclusion; the stocks are large and cheap. Lost production, and a step up in demand should keep markets well balanced – boosting margins. On the supply side, we have lost production from the Harvey related shutdowns. Plus, a possible delay to the CPChem start-up – it would be naïve to assume no other delays. Trash sacks, polyethylene containers, detergents, and other clean-up products. PVC pipe, other PVC building products, insulation, roof tiles, polyethylene house wrap, polyethylene pipe, packaging materials for other building projects. PET and polyethylene bottles for drinking water. DWDP – well placed in more than just ethylene, WLK the more levered all round winner (though a buyer of ethylene), but LYB also likely to do well. Stocks for building material companies and their suppliers have already moved, but we expect further upside as we could see as much as a 50-60% boost to equivalent “new home starts” in terms of demand in Q4 2017 and all of 2018. Inexpensive names include, OLN, TSE, HUN, POL, TRN, GNRC, SWK, RPM. Automotive boosted by substantial auto replacement – pick-up trucks in particular should do well with the Ford F150 likely coming out on top – good for DWDP. Coatings companies will also see a boost in demand so we are less cautious on the sector. Lastly, the trucking space will see increased demand to remove debris and deliver goods – this assumes that the companies can find drivers. In Exhibit 1 we show stocks with exposure and which are cheap. Please note that this piece was written with an initial view to identifying the smaller companies exposed to building and construction with likely upside from the terrible events of both Harvey and Irma, both of which are still ongoing – in that flooding has yet to subside in some areas of Houston. The ethylene conclusion came as part of the analysis and late in the thinking. Given that it is a subject that we have written about extensively and where we are already more positive than consensus we have devoted the rest of this report to ethylene. In Exhibit 1, we have identified other exposed stocks in our sectors that look interesting but admit that we have probably missed many outside of the ethylene space and we will follow up on segments with other exposure and also segments that might be at risk – for example Paper and Containerboard if there is a shortage of lumber and lumber prices rise. We do not believe that the new capacity being added in the US is surplus to global needs. The US additions require a major swing in global trade of ethylene derivatives but regional pricing currently encourages that swing. We see continued and robust demand growth for ethylene and particularly polyethylene given its greater consumer focus and strengthening consumer led economic growth. Cost advantages in the US should discourage investment in ethylene outside the US – as should escalating investment costs given the need to comply with tighter environmental standards globally and given the lack of qualified engineering and construction skills. The near term, caution in the US has been driven by the range of possible consequences for supply and demand as new ethylene production capacity and consumption capacity starts in the US and the impact of that timing. In recent research, we have talked about expected volatility over the next 12 months. 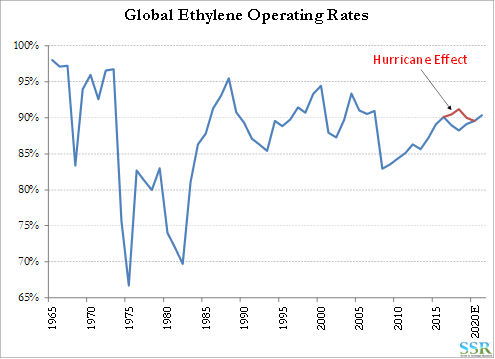 We now believe that, as a consequence of the Hurricanes, we should forget the cautious stance and go “all in” on ethylene now – the impact on expected global operating rates is summarized in Exhibit 2 and discussed in more detail below. We have lost production of both ethylene and derivatives because of Hurricane Harvey. As much as 50% of US ethylene capacity was taken off line, and while much of that capacity is being restarted, we have yet to hear from many of the majors with respect to more serious damage, start-up delays and lost production, including; Exxon, DWDP, LYB, Total, Ineos, and Shell. CPChem has indicated potential problems at its almost complete Cedar Bayou unit (the area registered over 50 inches of rain during the Hurricane). While many are trying to work out whether ethylene is temporarily long or short based on whether there is more ethylene capacity off-line than ethylene consuming capacity off-line, the longer-term consequence is that we have lost more production than we have global end-user demand. There is going to be a significant boost to demand for temporary housing – food supply – water supply – and longer-term new home construction and repairs. Polyethylene for food, water, house wrap and packaging of the building products themselves – 100% ethylene. PET – water and food packaging – 30% ethylene. PVC – pipe, siding, windows and doors, fencing – 50% ethylene. Styrene – SB latex for carpet backing, polystyrene for food packaging and insulation – 30% ethylene. Vinyl Acetate – coatings, packaging polymers – 35% ethylene. Polyurethanes – insulation and furniture – propylene derivative (percent depends on grade). Polypropylene – food packaging, carpets, building product packaging – 100% propylene. Acrylates – paint – propylene derivative (percent depends on which acrylate). Many more. Resins, Adhesives etc. Our assumption has always been that the ethylene market globally will remain well balanced and two months ago we wrote about volatility over the coming 12 to 18 month driven by the timing of ethylene and ethylene derivative start-ups in the US, against a backdrop of a robust global market. 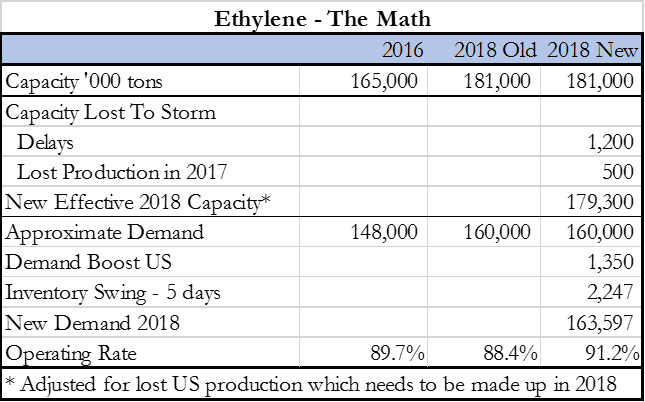 The worst-case scenario we could model at that time was a 1.5-2.0% drop in global ethylene operating rates in 2018 and 1H 2019 from the robust market we saw in 2016 – see the blue line in Exhibit 2. In a global ethylene market of around 170-175 million tons of capacity (150-155 million tons of demand) a 2% drop in operating rates would create a theoretical ethylene surplus of 3.4 million tons. Delays to the three large US start-ups by 3 months would drop production by 1.2 million tons. Lost production in Houston in September and October is estimated to be 400-500,000 tons – unlikely to be lower – could go higher – still unclear. US ethylene demand is hard to quantify – the US makes 27 million tons – going to 34 million tons over the next three years. The US exports around 6 million of the 27 million as derivatives. But likely imports more than twice that volume as finished goods – some of which are in the building and construction category. For the basis of this analysis we will be conservative and assume that the US consumes 30 million tons of ethylene a year. If only 15% of that is consumed in building, construction, infrastructure, furniture and carpets – ignoring the boost to packaging demand for now – we have 4.5 million tons of ethylene in the relevant space – assume half is for new homes. We have 200,000 homes seriously damaged in Houston, we should expect more than that from Irma – so let’s assume 500,000 homes that need to be rebuilt or substantially repaired, plus associated infrastructure. The new home build rate in the US is around 850,000 units per year – these hurricane losses could add as much as 60% to demand for materials in Q4 2017 and 2018 – in ethylene terms – if it is a direct correlation – 1.35 million tons. The expectation of increased demand should result in an inventory swing – we have assumed a gain of only 5 days of sales – but it could easily be 2x that level – it has in the past. In summary – See Exhibit 3 and the red line in Exhibit 2 we have the potential for 1.7 million tons of lost production between now and the end of 2018 and 3.6 million tons of additional demand – so a swing of 5.3 million tons in the supply demand balance for a market that – worst case – was going to see a 3.4 million ton surplus when we looked at it two months ago. We would buy the ethylene stocks today – DWDP is already one of our favorites, but we would now also buy LYB. WLK is likely to benefit from a very strong PVC market also, but is a big buyer of ethylene so may be limited on how much it can make near-term on the old Axiall assets. We also like TSE and OLN here because of valuation and because we could see a jump in demand for chlorine and styrene derivatives. Note that in addition to ethylene, DWDP has significant building product and automotive exposure. The numbers that we suggested for earnings for DWDP in the piece we wrote last week are already above consensus but did not include any boost from the analysis presented here. Note (in Exhibit 4) that DWDP has around 12 pounds of ethylene per share. A 10 cent per pound boost to ethylene chain margins would add around 90 cents per share to DWDP earnings in 2018. Obviously, the leverage for LYB is much greater.